Yesterday I mentioned that nothing can escape my appetite for ramp, not even a burger! 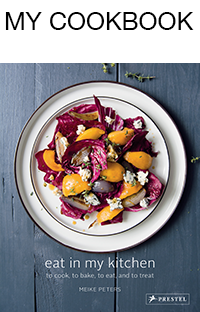 At first, my plan was to add just a few spices and leave the focus on the strong lamb meat. 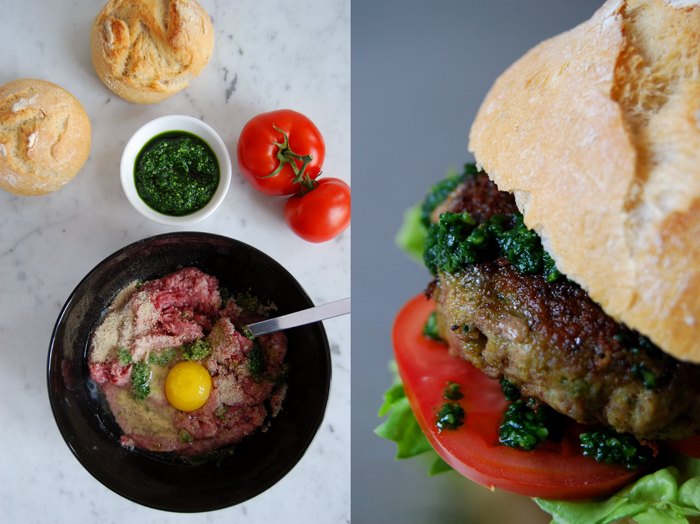 A juicy hamburger with tomato and lettuce, simple and pure, that was my idea, but when I saw the bowl with yesterday’s ramp pesto on my kitchen top I remembered a beef burger I had made two weeks ago with pesto mixed into the burger mixture and it was so good that I couldn’t resist! I had to make it again and added it to the lamb meat. 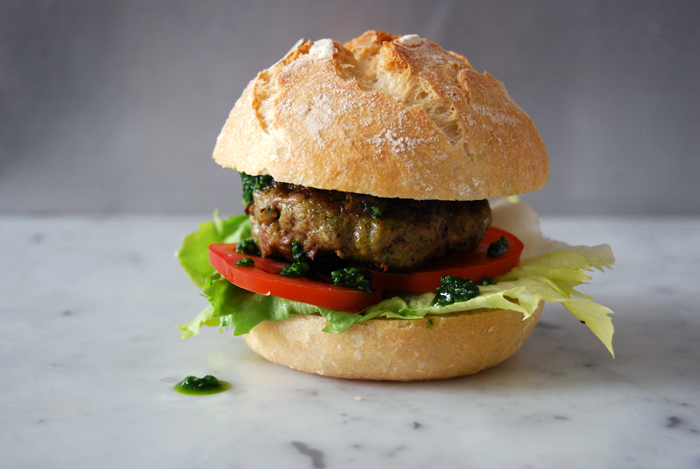 The pesto doesn’t only add its flavours but it also effects the texture and makes the burger very, very juicy. Usually, for my sandwiches on Wednesdays I measure the amounts for a quick lunch for 2, but I knew that this would have to be a proper dinner. It’s so good that you can’t stop after one burger! So I got 600g / 21 ounces of minced lamb meat and mixed it with 1 egg, 40g / 1.5 ounces of bread crumbs, 2 teaspoons of salt and ground black pepper. I stirred in 3 tablespoons of my ramp pesto (you can find the recipe here), but you could use any other pesto which matches the taste of the meat. When I made the beef burger I only added 2 tablespoons of the pesto as the meat isn’t as strong as lamb so I put in an extra one. To keep the meat juicy while its frying I form thick burgers. We had 6 which I fried in 2 tablespoons of butter and some olive oil, on high temperature which I turned down to medium immediately after I put the burgers in the pan. After a couple minutes on each side they turned a crisp brown, but still juicy inside. 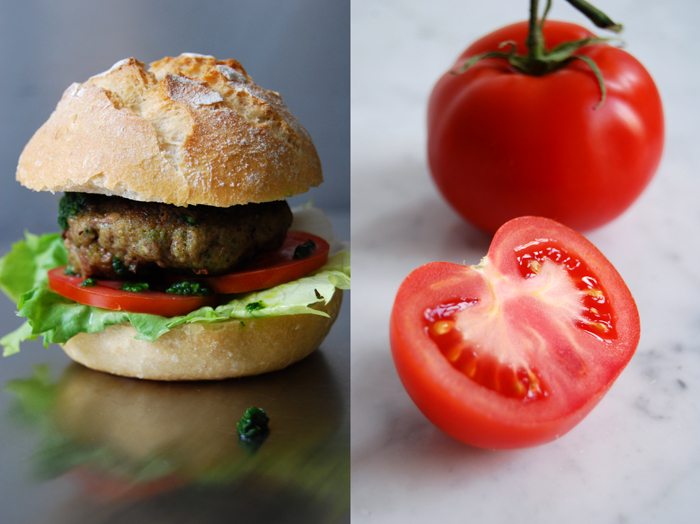 We put the burgers in some crunchy buns together with thin slices of tomato, a leaf of green lettuce and sprinkled them with some more pesto – and then we ate them all! 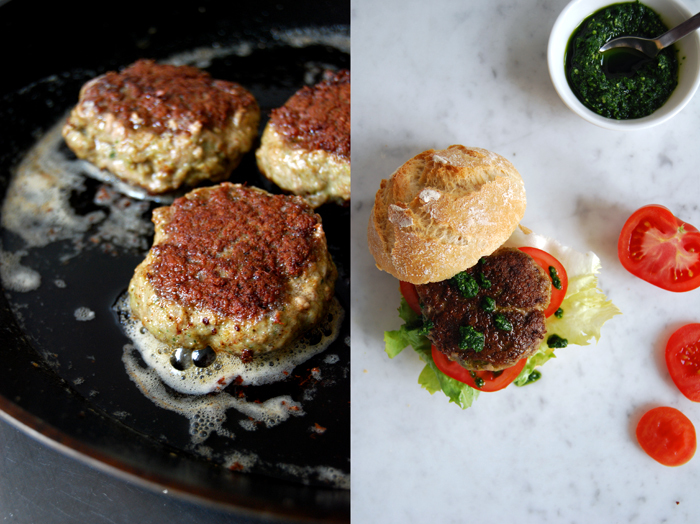 I love the idea of adding some pesto to the burger mix – what a tasty idea!